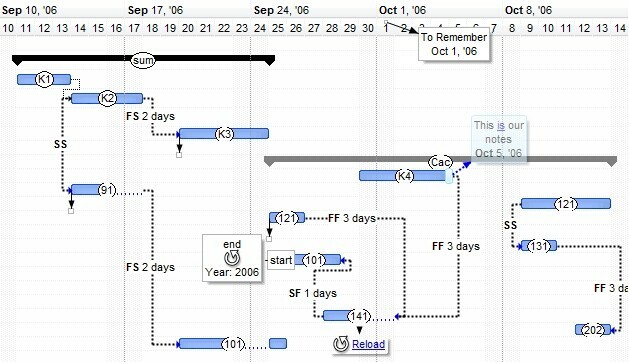 The Exontrol's exG2antt component is an editable grid component that includes Gantt chart features. The ex(G)rid-ex(G)antt, shortly exG2antt or ex2Gantt, combines the exGrid and exGantt components in a standalone component. 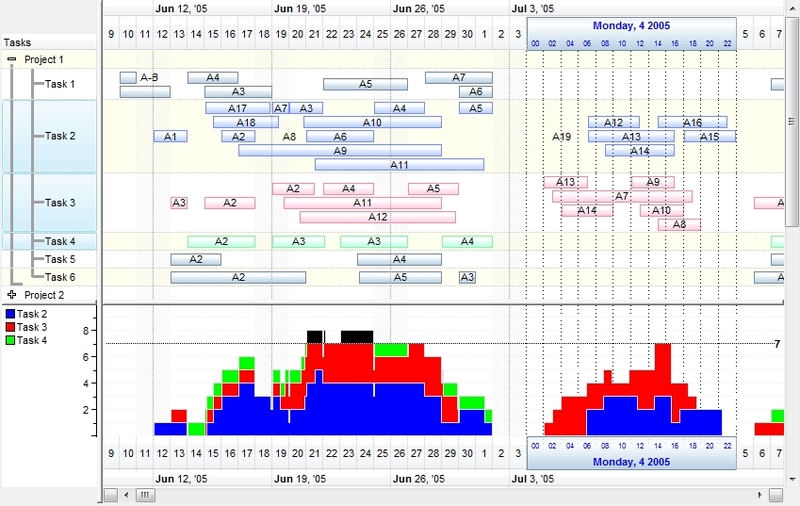 In other words, it combines a multiple columns editable Tree/Grid control with Gantt features, in a single component. The exG2antt library lets the user changes its visual appearance using skins, each one providing an additional visual experience that enhances viewing pleasure. Alternative HTML labels support for best fit in the level's time unit. Regional and Language Options support to display dates, times. Ability to enlarge or magnify (zoom-in,zoom-out) the entire chart, by dragging the header or resizing it using the middle mouse button, with or without re-scaling the chart. Ability to magnify only a portion of the chart, so the rest of the chart stay unchanged, ie shows hours of selected day(s). 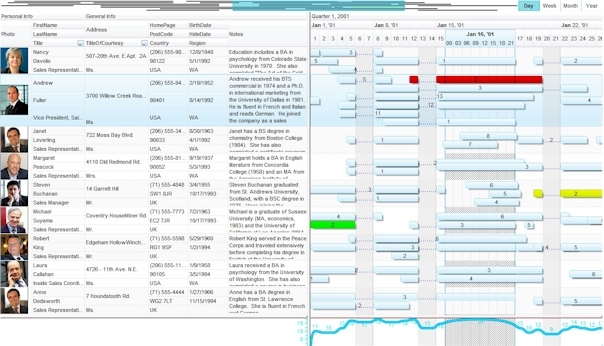 Ability to split the time scale in different sections, using different time scale units. cumulative bars using different colors, patterns, and so on. may display its legend or similar information using custom controls. Ability to specify different non-working parts for any item, using user-defined expressions. Ability to highlight the non-working part of the chart using days, hours, minutes or seconds. Ability to specify non-working dates using repetitive expression to indicate the Easter, Christmas or Holydays. Ability to display one or more columns in CRD format on the chart part. Automatically update the bar captions or tooltips, using its properties combined with HTML format and computed fields. Ability to resize or move the bars in the chart, at run-time. Ability to move the bars in the chart, from an item to another, by drag and drop or by code as well. Ability to define your own type of bars using gradients, custom patterns, shapes or EBN objects. Ability to define the starting and ending corners from icons. Ability to show the current date-time using EBN files. Ability to highlight or mark different date-time zones, using different colors, EBNs, patterns, multiple HTML captions. Ability to link bars using the mouse. Ability to group bars, preserve the length of the bars, fixing ( or within a specified range ) the distance between bars. Ability to group the linked bars. Ability to select bars and links using the mouse, as well as moving or deleting them. Ability to customize the overlaid bars using different offset, transparency, colors, patterns, shapes, and so on. Ability to specify the range to move or resize individual bars. Ability to summarize the bars, so once a child bar is moved or resized the parent or the summary bar is updated accordingly. Ability to define your custom labels for levels, including subdivisions. Undo/Redo mechanism for operations in the chart, as moving, resizing, creating bars or links and so on. Ability to associate the cells with the bars, so you can easily update the bar's properties using the cell's editor, and reverse. Built-in Editors support, in other words editable at runtime. Ability to filter items filter items using patterns, is, is after, is before, between a range of dates, numeric with an interactive user iterface. The eXG2antt is editable at run-time. The eXGantt is read-only at run-time.